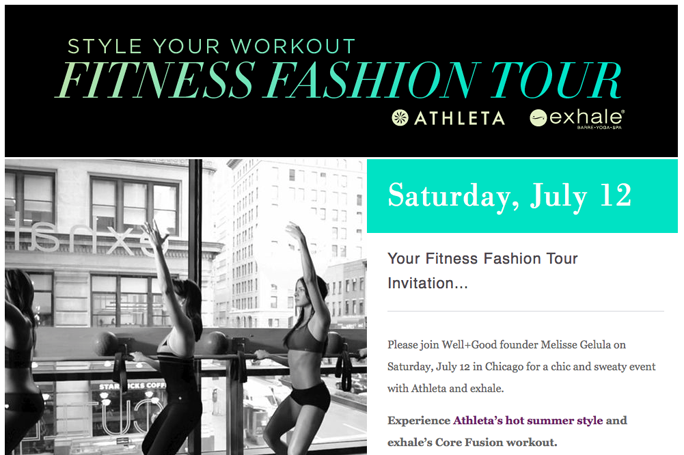 "Please join Well+Good founder Melisse Gelula on Saturday, July 12 in Chicago for a chic and sweaty event with Athleta and exhale. Experience Athleta’s hot summer style and exhale’s Core Fusion workout. Then take exhale’s popular Core Fusion class and linger with us to enjoy mini spa services, mimosas, and cold-pressed juices from BluePrint. We can’t wait to meet you! Cost is $25 per single class, including all the fashion and beauty perks (less if you have a class package or membership). What’s the editor’s class? Well+Good editors will be jumping into the Core Fusion class and giving away two $50 Athleta gift cards. Being in the class automatically enters you to win! Got questions about this event? Write us at concierge@wellandgoodnyc.com"